Consider a Cartesian coordinate system , consisting of an origin, , and three mutually perpendicular coordinate axes, , , and . (See Figure A.4.) Such a system is said to be right-handed if, when looking along the direction, a clockwise rotation about is required to take into . Otherwise, it is said to be left-handed. It is conventional to always use a right-handed coordinate system. 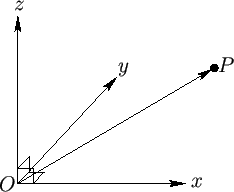 Figure A.4: A right-handed Cartesian coordinate system. where , , and are termed the Cartesian components of . It is conventional to write . It follows that , , and . Of course, .